Over the years, I’ve met my share of finicky cats. There was my beloved Goldie who would eat food from just one supermarket and always knew if I shopped somewhere else. And then there was my elderly OC, who would only eat if I sat with her and moved her dish around in circles to make mealtime more interesting. My current cats refuse to eat from dishes washed with soap. Oh, and they don’t like food from the pet supply chain stores either. If you suddenly have a finicky cat, rule out medical problems first. An upper respiratory or urinary tract infection, pancreatitis, gum disease, diabetes, hyperthyroidism and kidney disease can all cause a cat to lose its appetite. Some medications, especially some antibiotics and thyroid medicine, can cause lack of appetite, too. 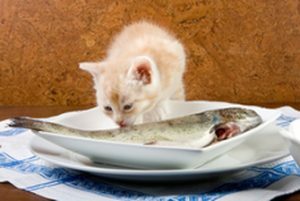 But if your cat’s just being picky, here are some ways to get your finicky cat to eat. If your cat is a picky eater, warming his food will make it smellier and more appealing. Or try these smell and flavor enhancers to turn his ordinary cat food into food he can’t resist. 1 Liquid from a can of tuna: Mix it into his food or pour some on top. 2 Catnip: Sprinkle it on the food or just give him a mound to play in before he eats. Catnip is a mild appetite stimulant. 3 Warm, unsalted chicken broth. It makes an irresistible “gravy.” Just be sure the broth doesn’t contain onions, which can be toxic to cats. 4 Warm bacon or chicken drippings. Or just crumble some warm bacon on top of the food. 5 Grated Parmesan cheese: Sprinkle it on top of the food. Or add a tiny bit of salt. Most cats like salt, and a few grains won’t harm them. 6 Treats: Put them on top of the food, or mix them in. He’ll have to eat the food to find the treats. 7 Stella and Chewy’s Freeze Dried Raw Chicken : Crumble a couple of cubes over your cat’s wet food. Stella and Chewy’s comes in other flavors, too. 8 Pure Bites : These are also freeze dried chicken to crumble on top of your cats food. Pure Bites for dogs and cats are exactly the same, except the bags for dogs are bigger. 9 FortiFlora : Sprinkle this probiotic on your cat’s wet food to make it smell like dry. Vets sell it, or you can buy it online. 10 Deli chicken or turkey: Put a few pieces on top of your cat’s food. Buy a kind that doesn’t have any artificial flavors or preservatives. Tip: Wash your cat’s dishes in very hot water but no soap. Soap can leave a residue that smells and tastes unpleasant to cats. If you wash his dishes in the dishwasher, use unscented dishwasher soap. Only the “Fancy Feast cat” expects a linen tablecloth and crystal goblet. But while your finicky cat may be less demanding, a properly set table will encourage him to eat. — Whisker stress can discourage a cat from eating. Your finicky cat will be more likely to eat if he has a bowl that’s wide and shallow so his whiskers don’t touch the sides. Or put his wet food on a small plate. The best cat bowls are glass or stainless steel. Plastic can develop cracks that harbor bacteria and can cause painful chin acne. — If you have more than one cat, their dishes should be at least several inches apart. The further away from each other, the better! Like humans, cats like some elbow room when they eat. — Give every cat their own bowl for wet food. Outside, they wouldn’t share a mouse. That wet food you serve is their version of a mouse, and the cats don’t want to share! — Many cats are more comfortable eating from dishes that are slightly elevated. — As cats see it, there’s no reason why everyone should have to eat in the kitchen. 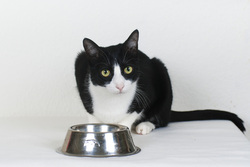 Especially in multicat families, let your cats decide where they’re most comfortable eating and serve their food there. Sizzle, Myles and Soda like to eat in my office. Ginger recently turned a large closet into her “purrsonal” dining room. — Put your cats’ water bowls as far from their food as possible. Another room is best. Cats taste their water, and if there are crumbs of food in it they won’t want to drink it. Sometimes when cats are picky eaters, they’re not being difficult, just smart. Instinct tells them to be very careful about what they eat because if they eat something that’s spoiled or poisonous, they could get sick and won’t be able to hunt or defend themselves. While these may seem like non-issues for house cats, that wild instinct is never far from the surface, even in cats who live completely indoors. To appeal to a cat, food has to do more than pass the taste test. 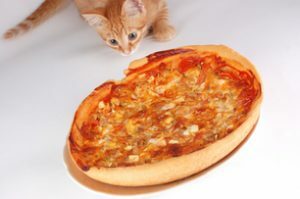 Cats also decide whether food is safe to eat by its smell and texture. If a cat can’t smell its food, or if the food doesn’t smell just right, the cat won’t eat it. And cats may also refuse to eat food that doesn’t have the right texture, or feel right in their mouths. My Honey Cat and Katie love pate. Belle and Boccelli think it’s disgusting and will eat only chunky food, and the bigger the chunks the better, in gravy. These tips and tricks work for many cats, even if they have a chronic disease that affects their appetites. But your cat needs to eat, even if he’s not feeling well. If he stops eating, he needs to see a vet. Ask for an appetite stimulant and medication for nausea. If he’s nauseous, an appetite stimulant will make him hungry, but he still won’t eat. If all else fails, see if he’ll lick baby food or cat food, a tiny bit at a time, off the tip of a spoon or your finger. Or smear tiny bites of food inside his mouth. Syringe feeding is another way to get some food into him. This video will show you how. What’s the best diet for cats?